" Hello,Inspector Simi on the line,who I'm I speaking with"
" Hello ma,its Corporal James, Ma we've lost Mr Ibukun "
" What! What do you mean by that. You better find him"
" I'm afraid we can't do that, He's dead,he died few minutes ago"
" oh my my! How did it happen"
" it was an accident ma"
I dropped the phone and drove off to Iju.
" Corporal James,what exactly happened" I inquired.
" hmmm! This is very devastating " I said as I surveyed the scene of the accident. I inspected the trailer and the car. The car was badly damaged beyond repair. I turned to James and questioned him " what did you people find out? " "Actually ma,we couldn't pick up anything on him or from anybody around. He came into town today and before we could find out anything,the accident happened." James replied.
" Arrest the mother and interrogate her,I need to get some answers. Meanwhile do not injure the old woman " I said as I moved over to my car. I entered my car and sped off. And I haven't gotten a lead or even found the girl .I sat up and paced around, even Mr Ibukun's mother did not say anything meanigful. Grinnnnnnnn grinnnnn grinnnnn,my phone rang. I moved over to the desk and picked up the call.
" Yes, Inspector Simi on the line"
" Hello,this is Kade "
" Kade from Femidaba hotel. Ma,I have some valuable information concerning Miss Ejiro Tega. Can I see you soon?" " Oh! Sure. I'm in my office." " I will be coming. Uhhhh! I sighed. I hope this information is worth it. I sat behind my desk in my office, a friendly gleam in my eyes. "Sit down" I said to Kade . I was just too eager and anxious to hear what he has to say. He sat down in one of the arm chair in the room and began to talk.
" this morning,I was going through the music on my phone when I stumbled on a recorded conversation on my phone." I quickly adjusted myself and sat upright. "..........the conversation actually amazed me because it wasn't my voice. I later remembered that Miss Ejiro Tega made a phone call with my phone that day"
"Wow! But you didn't mention this to us" I cut in. "It skipped my mind,I wouldn't even have thought about it,if I had not seen this recording in my phone. You can record your calls,when calling on my phone. Miss Ejiro Tega came down to the bar that night and begged to use my phone to call someone. Intact she made the call in my presence. It was on April 23." He said terrifically.
" play the conversation,let me listen to it" I ordered. Reciever:Babe,Aliya,longest time...you left without leaving any contact. nawa for you o.
Caller:no vex...bye. we'll talk later.
" 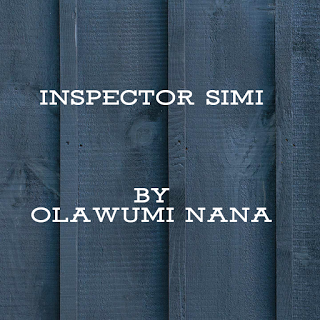 no problem Inspector"he collected a piece of paper and began to write his sentence.
" Hello,Hassan,We've got work to do. We are going to Ecotel's office right now. I'll be waiting outside the office"